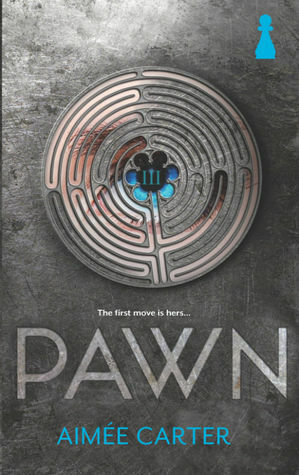 Presenting The Blackcoat Rebellion #1 Pawn by Aimee Carter. This is a world ruled by ranking, a way of deciding your worth and a powerful controlling aristocratic propaganda. Rather bleak circumstances I tell you. The setting does seem familiar there but Carter does something marvelous, she makes it her own. There is political intrigue, a sense of deception, a conspiracy, the hidden dark face of politics, a case of agendas and the romance which actually takes the backseat for this plot. Kitty Doe, is the protagonist. Her resemblance to the Prime Minister's niece Lila Hart keeps her on their target list. What I liked most about her? She felt real as a real life person. She may have fallen into the clutches of the Harts and 'masked' to look like Lila, she doesn't exactly rush to do the right thing, because she hears of the rebellion but isn't quick to join as you would expect. She is skeptical at first because she is a survivor and leading a rebellion does not guarantee that at all. Her low rank may be for life but she soon adapts to the life of a high rank and even gives that identity her own touch. She is strong willed and determined to keep her loved ones safe.... So what if the face she wears is not her own. Through her actions she makes it her own..... maybe even do some good with it too while she is at it. Benjy and Knox. They are two possible love interests here. An almost triangle, though romance takes the back seat because it is the rebellion that maters. One is the over protective boyfriend and the other is more of a friend.... well we'll have to see what happens in the next books to fully gauge the circumstances. But I liked Knox. He was quite the dynamic character. He is her support there and plays that pretty well. Can't say much for Benjamin aside from that he loves Kitty and is prepared to do anything to keep her safe. Politics is literally a big game of chess and 'Pawn' both literally and figuratively elaborates just that. Political chaos being the perfect example of dystopia, there is thankfully no info-dump. Aimee Carter illustrates this new world in a clean cut way, bit by bit as the story progresses, if you have read her Goddess Test series then you'll know she does that pretty well without things becoming overbearing. This is a fast paced read and like all fast paced reads, things happen, secrets are unveiled, twists and turns pulled in, the conspiracy and the rebellion takes shape..... and you just won't be able to put it down amidst all the continuous action at all..... Not one bit. "Aimee Carter leaves you breathless with her new unputdownable and stunning dystopia"